REN Flash Hydro-Boost, skin care done right. All my skin care efforts come undone in February. I’ve always had an oily T-zone, with normal skin elsewhere, but for the first time, I felt dehydrated on a cellular level. You know what I mean? So, I reached for Hyaluronic acid. This is the first time I’ve tried Hyaluronic acid. As an oily skinned girl, I’m wary of how a loss of hydration can send my skin into overdrive, so I’m not a fan of oily or heavy quick fix moisturisers that barely scratch the surface. Hyaluronic acid seemed logical, because of how just one molecule holds a thousand times its weight in water. 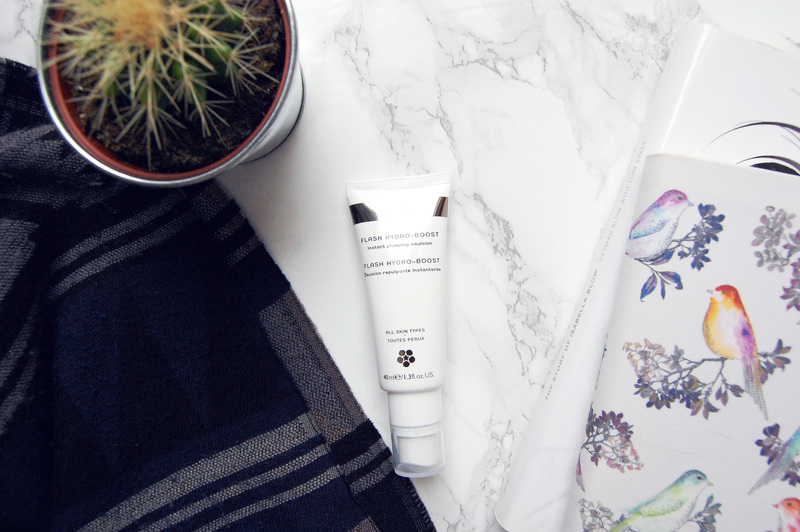 I love REN and I’ve tried most of the range by now, and the new Flash Hydro-Boost Instant Plumping Emulsion is now my favourite alongside the Bio-Retinoid Anti-Wrinkle Concentrate Oil. The science behind Hyaluronic acid is fascinating, and you can find more about it here, but I’ll keep this review simple. Aside from Hyaluronic acid, this serum is made with germ oil, shea butter, cranberry seed oil, rosemary leaf extract and sunflower oil. As with the rest of REN’s range, the Hydro Flash-Boost is paraben, silicone, and sulfate free, and is naturally fragranced. It smells rather nice, and doesn’t irritate my skin, so I have no complaints. A single pump is enough to cover my face. You then need to dampen your hands and massage the water into your skin to activate the serum. This may seem fiddly, but it’s necessary. I recommend using the Caudalie Grape Water for a zero-fuss application. The dose of hydration is instant, and I can always feel the difference in my skin within a few minutes. Considering the heavy dose of hydration, my fine lines are less visible, my skin looks radiant and plump, and my complexion a lot brighter. The best part? It’s entirely weightless and I would say oily skinned people could use this as well. I love using this as my morning serum, as it leaves my skin velvety smooth, but I also use it in the evening at least once a week. I’m so incredibly happy with how my skin looks right now! What’s your choice of morning serum? It's quite strange when that happens. I was in denial for a while! It's so simple but incredibly effective. My skin is still going through this uncomfortable phase, but when I use this every morning, the relief is instant!